Avery McGrail is a past Chalk it Up! youth category winner. The downtown sidewalks will temporarily become transformed from its blank slate of asphalt into a patchwork quilt of bright colors for July’s First Friday event tomorrow. The fourth annual Chalk it Up! contest will take place Friday on Sandusky Street between William Street and Central Avenue, and Winter Street between Franklin and Union streets. “Anybody can come down and chalk the sidewalks. Sometimes we have people working from morning to evening,” said Frances Jo Hamilton, executive director of Main Street Delaware, the non-profit organization which puts on First Fridays. 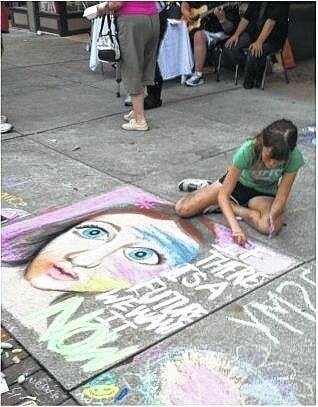 Sidewalk squares can be chalked up for the fun of it for free, or as part of a contest with prizes for $10 a square. To register for the contest, print out a form from http://www.mainstreetdelaware.com or pick one up at Button Up, 29 N. Sandusky St. Volunteers will start collecting the forms at 6 p.m., and the public can vote for their favorite youth and adult drawings at 8 p.m.
Artists are encouraged to bring their own chalk (as long as it isn’t oil-based), but there may be a couple of buckets full of chalk on hand for those who don’t have any. Funds raised from the contest will support future Main Street events and downtown beautification efforts. The drawings will remain on the sidewalks until they are washed away.